Joelie Sanguya, Clyde River, Nunavut shares his wisdom about keeping dogs. Clyde River, Nunavut’s Joelie Sanguya is an educator, a partner in Piksuk Media (producers of the six-part documentary Nunavut Quest: Race Across Baffin), sits on the board of the Ilisaqsivik Society. He is also a hunter and traditional dog team owner. 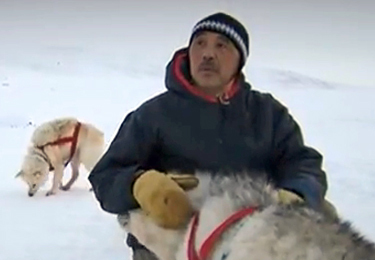 This past December Radio Canada International (RCI) produced for Eye on the Arctic a nearly thirteen minute video of Sanguya entitled “An Inuk hunter on the importance of dog teams”. In this presentation Sanguya is seen out on the ice surrounded by his dog team. Dogs are seen running loose all around, being group fed high quality kibble and working in harness. Sanguya discusses the culture between dogs and master, the importance of maintaining a good relationship, how dogs are named, teaching dogs the language of dog teaming, understanding the language of dogs and the message they are trying to convey, his job versus the boss dog’s job, how dogs are put into the fan hitch, training dogs to come back should the snow hook fail, the importance of not loosing a team, the dogs knowing how to get home in a thick fog or blizzard when he cannot find the way, the freedom of traveling by dog team. The presentation is in English with French subtitles.